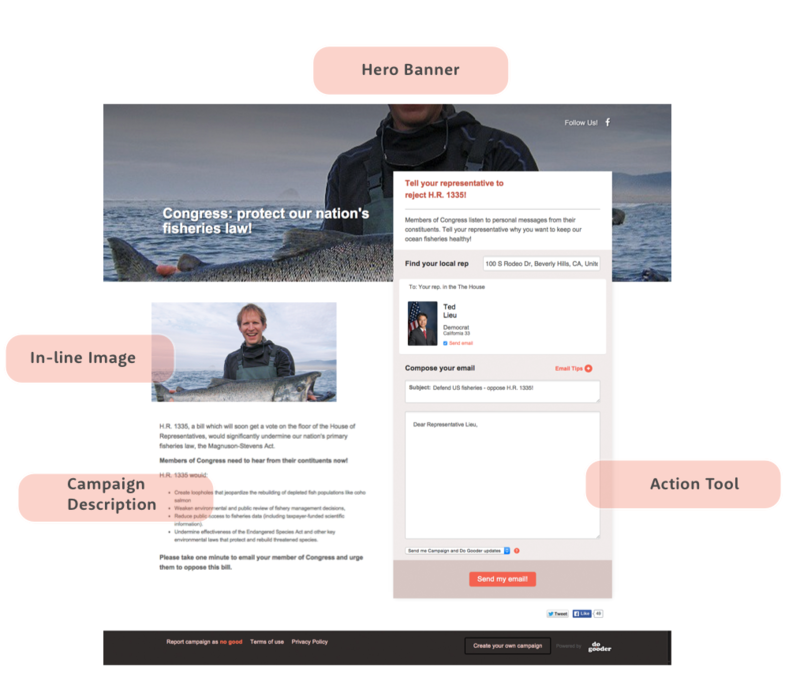 To create a Do Gooder campaign microsite or embedded action you first create a campaign, then add content; including the hero banner image, the campaign description plus an an in-line image/video. (If you are embedding the action into your own site and will not be sending people to the Do Gooder microsite you can skip imagery and campaign content as this will not be shown). Each campaign is highly customisable allowing you to set follow-up emails, share content for Facebook, Twitter and email, theme customisation, privicacy settings, country settings and so on. If it's your first time and you’re just getting started you can safely leave all of these settings at their defaults. Once you have finished setting up your campaign you then need to add one or more Action tools. These provide the functionality for the actual thing your supporters will do (email/call/donate etc). Once you have added at least one action (you can daisychain one or more actions after the first one if you wish) your microsite is ready to launch (or once saved you can grab the embed code for the action to paste into your own site.